﻿ DVDFab Lightning-Shrink helps you rip or convert Blu-rays within one hour. Brief: What is DVDFab Lightning-Shrink? Targeted at Blu-ray ripping and converting, Lightning-Shrink is newest decoding and recoding technology DVDFab Team has developed. It helps Blu-ray lovers to rip their Blu-ray collections with Blu-ray Copy for personal backup, or convert them with Blu-ray Ripper for playback on all kinds of portable devices, smart phones, and tablets, etc, in a very fast manner. It is not the world's first decoding and recoding technology you have ever met, but it is absolutely the best kind you've never seen before. What Does DVDFab Lightning-Shrink Do? Just as its name implies, DVDFab Lightning-Shrink takes the advantages of nVIDIA's CUDA hardware acceleration and NVENC technology, or Intel Quick Sync, to significantly cut down the time you spend on ripping or converting Blu-ray movies, shockingly to within an hour. That's to say, with DVDFab Lightning-Shrink technology, your nightmares of 5+ hours on ripping or converting Blu-rays are gone, forever! In What Circumstances Can I Benefit from DVDFab Lightning-Shrink? Are There Any Special System Requirements? NVENC-based Lightning-Shrink: nVIADIA’s CUDA 5.0 rated Graphics Card, like GTX 750/GTX 750 Ti (driver version: WHQL 334.89 or higher) which employs the NVENC technology, is required. 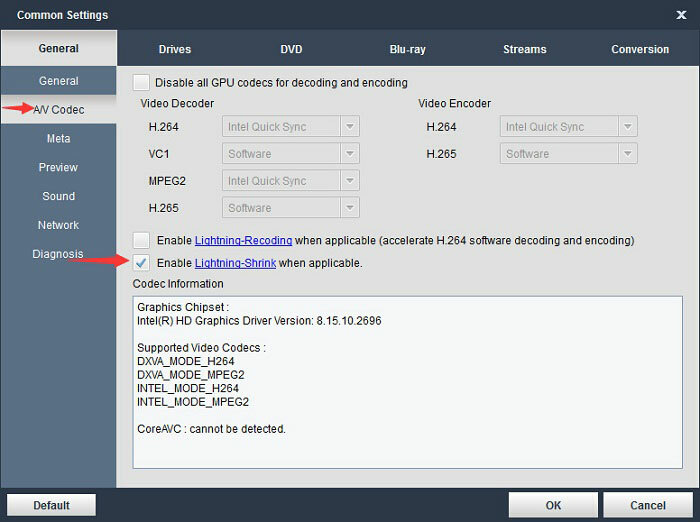 How Do I Apply DVDFab Lightning-Shrink? It's easy: Open Common Settings panel via the gear icon at the top right corner of DVDFab 9 newest version, navigate to General>A/V Codec, and then mark the option of "Enable Lightning-Shrink when applicable". Next, click the "OK" button on that window and restart DVDFab 9 so that the settings shall take effect.